Storage giant Western Digital has announced that they have started volume shipments of their WD Scorpio Blue 9.5mm, 2.5-inch mobile hard drive in a 1 TB capacity. The drive, which conforms to the industry standard 9.5mm form factor, features two internal 500 GB platters and makes Western Digital the first to reach such capacity in a 2.5-inch notebook-friendly design. Western Digital currently offers two classes of mobile hard drives; Scorpio Blue and Scorpio Black. Blue represents their mainstream offering with a focus on low power consumption, large capacities and competitive pricing. A typical Blue series drive spins at 5400 RPM with an 8 MB cache. Black series drives are geared for performance enthusiasts and feature a faster 7200 RPM drive speed with 16 MB cache. Solid state drives are widely accepted as the “future of storage” and although prices have come down and capacities have increased since their inception, SSDs still face a large hurdle before they will trump traditional spinning disks. As such, drives like the 1 TB WD Scorpio Blue are still very much relevant to those looking for maximum portable storage without the need for a tag-along external hard drive. Western Digital is shipping the 1 TB Scorpio Blue now through select distributors and resellers. 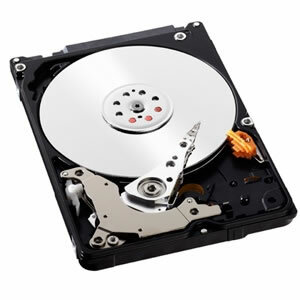 The drive is backed by a standard 3-year warranty with an MSRP of $139.